October 1st marked the beginning of a new Kiwanis year. Lafayette Kiwanis pauses to thank Bill Friedman for his service this past year as our 2015-16 Club President. 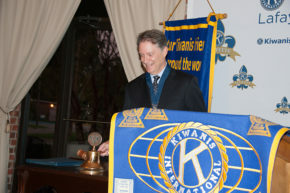 During his term, the club participated in numerous projects that have made an immediate and direct impact on the lives of the children of Acadiana including: Operation Magi; Kiwanis One Day; and, of course the 64th Annual Kiwanis Football Jamboree. Thanks, Bill, for all that you do!